The prelude to the festivities of the 2018 FIFA World Cup in Russia, and, of course, the famed Panini World Cup cards, 2017 Panini Road to 2018 World Cup details the lead-up to the quadrennial competition. Consisting of around 480 sticker cards in the main set, 2017 Panini Road to 2018 World Cup highlights the top teams and players in contention for the tournament. What it lacks in flash, it makes up for in detailed coverage and taps into the regular hype surrounding the simple stickers. 2017 Panini Road to 2018 World Cup teams include Argentina, Brazil, Chile, Germany and Spain, among others. Top players include Cristiano Ronaldo, Lionel Messi and Neymar. Collectors can also find a 64-page album that is specifically made for the 2017 Panini Road to 2018 World Cup set. The full-color album can be used to house the many stickers in a convenient format. 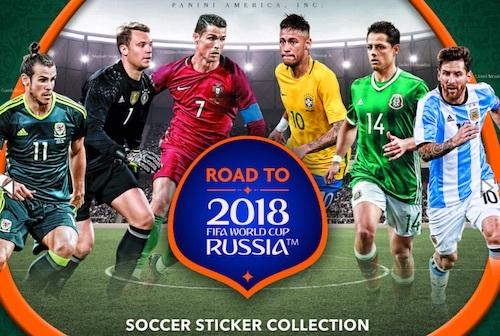 Just like the 2014 World Cup in Brazil, a separate sticker set will be issued closer to the actual event, once the participating teams are decided. Take a look back at the previous sticker releases with a detailed gallery of the World Cup albums. The 2018 FIFA World Cup is scheduled for June 14 to July 15, 2018. It ends with the title match in Moscow. Panini RUSSIA World cup 2018 FIFA 104 Packs Box Made in Brazil All 32 Teams !! !